Tunisia is a country in Northern Africa, bordering Algeria and Libya. The third boundary of Tunisia is a Mediterranean coastline of 1250 km. The capital of the African country is named Tunis and her old part, known as Medina, is a monument of world historical heritage by UNESCO since 1979. 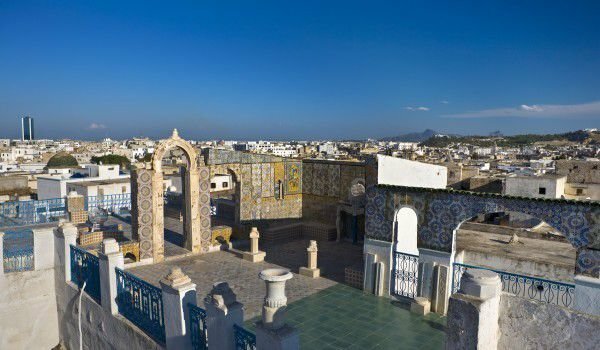 It has vast architectural and cultural heritage, which has preserved the old town of Tunis, which makes it the unofficial center and most important place that is visited annually by millions of tourists from around the world. It is best to visit Tunis in spring and autumn, because the summer temperature here is quite high. Tunis is located in the inner part of the Gulf of Tunis, in the north of the Lake of Tunis, which is connected by a canal to the Mediterranean. Tunis is an important port city with a population about one million people. All of Tunis was built on the ruins of the city-state of Carthage. This historic center was conquered by the Roman Empire, which left from there in the 5th century. A little later, in the 7th century, Arabs conquer today's Tunisian lands, and later they become part of the Ottoman Empire. In the 19th century Tunisia was under Ottoman rule, but over time it acquired its independence. 1881 Tunisia became a French protectorate, as they built a "new" Tunis next to Old Town, which begins to lose its meaning. In 1956, it received its final independence. The remains of Carthage are located north of the bay. In 146, the Roman settlement is literally flattened. A hundred years later, Emperor Julius Caesar rebuilt it, in an effort to revive the African possessions. Tunis was the second most important city after the capital of the Roman Empire. Then followed a period of decline and later- a new dawn. Tunis was again destroyed by Arabs in the late 15th and early 16th century. Today, unfortunately, not many other archaeological data bases provide more information about ancient Carthage, mostly because of the complete destruction of architectural monuments and the subsequent vandalism over their remains. Today, Tunis is still an exotic tourist destination offering many attractive experiences of the Orient. The old town of Tunis was built oval and surrounded by walls. From its many narrow streets you can see many colorful markets and the incredible architectural fusion, which the buildings in the medina offer. Among the decorative architecture here feature some 400 buildings in Art Deco style. A typical example of such a building is the impressive Bublil Villa, which is located near the Park Belvedere. In the medina of Tunis you can see many amazing historical sites, including 700 officially declared cultural monuments. Palaces, mosques, mausoleums, fountains, etc. One of the most exciting buildings here in Tunis is the Great Mosque, which includes the Muslim University in Tunis and the national library. Particularly exciting are tours in the palace Dar al-Bay, and the museum "Bardot". This median gallery today is a former palace of Hafsids. Today you can see an amazing collection of Roman antiquities and ancient mosaics.